What's the "best" way to convert a number to a string (in terms of speed advantage, clarity advantage, memory advantage, etc) ? It should be noted that the difference in speed is not overly significant when you consider that it can do the conversion any way 1 Million times in 0.1 seconds. Update 2: Again based on my test above it should be noted that Firefox 20.0.1 executes the .toString() about 100 times slower than the '' + num sample. In my opinion n.toString() takes the prize for its clarity, and I don't think it carries any extra overhead. So, for the above reasons I'd go with: n.toString() or String(n). String(n) is probably a better choice because it won't fail if n is null or undefined. The simplest way to convert any variable to a string is to add an empty string to that variable. Short, succinct, already used in many other places (if you're using a modern framework / ES version) so it's a safe bet any programmer will understand it. Not that it (usually) matters much, but it also seems to be among the fastest compared to other methods. If you need to format the result to a specific number of decimal places, for example to represent currency, you need something like the toFixed() method. digits is the number of digits to display after the decimal place. I like the first two since they're easier to read. I tend to use String(n) but it is just a matter of style than anything else. I think it depends on the situation but anyway you can use the .toString() method as it is very clear to understand. As of 24th of July, 2018 the results say that number + '' is the fastest in Chrome, in Firefox that ties with template string literals. 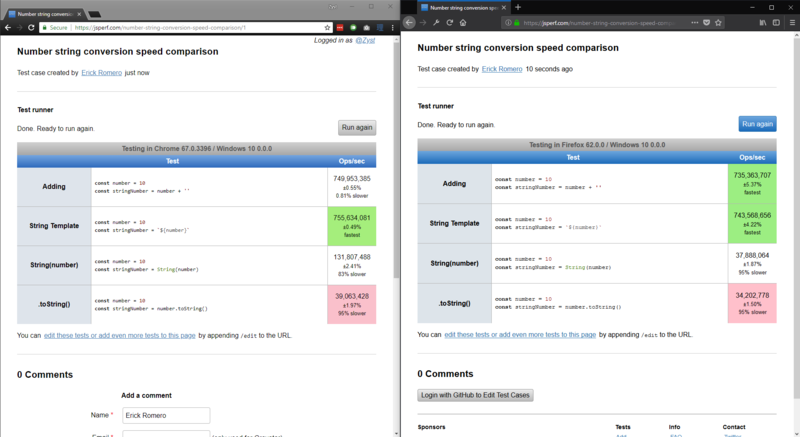 Both String(number), and number.toString() are around 95% slower than the fastest option. IMHO, its the fastest way to convert to string. Correct me if I am wrong. The only valid solution for almost all possible existing and future cases (input is number, null, undefined, Symbol, anything else) is String(x). Do not use 3 ways for simple operation, basing on value type assumptions, like "here I convert definitely number to string and here definitely boolean to string". String(x) handles nulls, undefined, Symbols, [anything] and calls .toString() for objects.
'' + x calls .valueOf() on x (casting to number), throws on Symbols, can provide implementation dependent results. x.toString() throws on nulls and undefined. Note: String(x) will still fail on prototype-less objects like Object.create(null). * Safely casts any value to string. Null and undefined are converted to ''. .toString() is the built-in typecasting function, I'm no expert to that details but whenever we compare built-in type casting verse explicit methodologies, built-in workarounds always preferred. If you are curious as to which is the most performant check this out where I compare all the different Number -> String conversions. Looks like 2+'' or 2+"" are the fastest. We can also use the String constructor. According to this benchmark it's the fastest way to convert a Number to String in Firefox 58 even though it's slower than " + num in the popular browser Google Chrome. Method toFixed() will also solves the purpose. You can call Number object and then call toString(). Just come across this recently, method 3 and 4 are not appropriate because how the strings are copied and then put together. For a small program this problem is insignificant, but for any real web application this action where we have to deal with frequency string manipulations can affects the performance and readability. Here is the link the read. Similar times each time I ran it. How to change object value type in Java Script? Undefined is not a function“”"
How to implement toString to convert a number to a string? How do I convert numeric values to strings?